1、句型一：Be + 主语 + …? 用法说明：在含有连系动词be的将来时(shall / will + be) 或完成时态(have / has + been) 的句子，改为一般疑问句时，只需将shall / will 或have / has提到句首。如：Will they be at home tonight? 他们今晚在家吗? 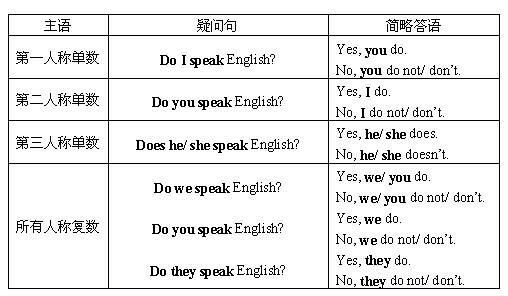 2、句型二：Do / Does / Did + 主语 + 谓语 +…? 3、句型三：情态动词 + 主语 + 谓语 +…? 4、句型四：Have / Has + 主语 + 过去分词 +…? 例句：Is he not a student? 他不是学生吗? 例句：I'm in Class 2 Grade 1.→Are you in Class 2 Grade 1? 例句：He can swim now.→Can he swim now? 例句：I like these animals.→Do you like these animals? ●以疑问词开头，对句中某一成分提问的句子叫特殊疑问句。常用的疑问词有：what who whose which when where how why等。特殊疑问句有两种语序：谓语动词+其他成分? 一般疑问句是疑问句的一种。它是指用“yes”或“no”来回答的句子。其结构是：系动词be/助动词/情态动词+主语+其他成分?如：Is this your pen?--Yes it is./No it isn't.